Above is a February 20th view taken from the end of the trail near the base of the Franz Josef Glacier on the west side of New Zealand’s South Island. Below is an even better look at the details of the ice and rocks at the place where the glacier passes from existence to non-existence. Eve saw a little ice fall off the front of the glacier. My question answered before I even asked it. How warm was it? I imagine that when it’s above freezing, there would be constant runoff from the glacier. I hope I get to see it one day. Thanks for sharing your pictures. You’re welcome. I also hope you get to see Franz Josef Glacier someday. There’s another one near by, Fox Glacier, but after hours of walking and taking pictures I no longer had the time or energy to visit it. I hear you. I’ll have to be in good shape to manage all the walking. I’m surprised that, at summer’s peak, there seems to be no sign of any significant meltwater. And, if you get another chance to explore the area, the Fox is far easier to approach–at least it was when I was there a couple of decades ago. You don’t see it in these views, but there was meltwater in the form of a stream off to the right. I believe meltwater also fed into some waterfalls, a couple of which you’ll see next time. 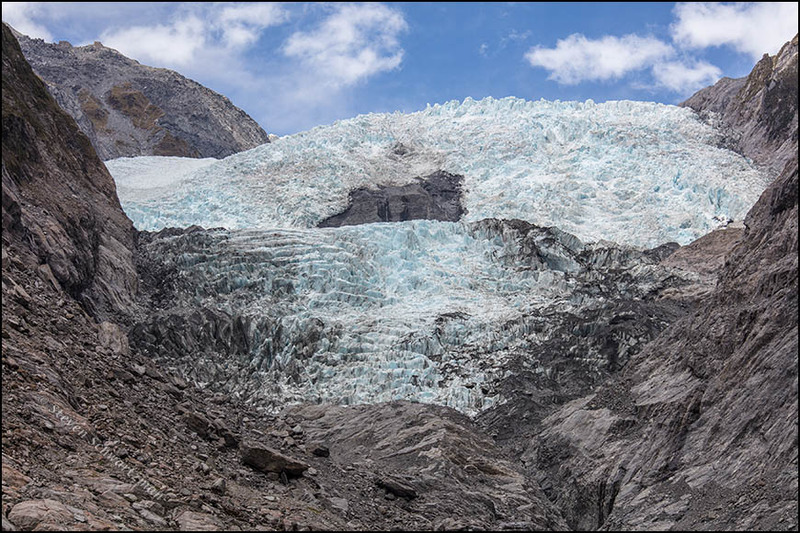 In recent years, this glacier has also shown signs of rapid retreat. Thank you for your beautiful photos! I was in New Zealand two years ago (June), however, when we got to Franz Josef Glacier it was raining and foggy, so we did not have a chance to see it. I hope that some day I can come back and experience the beauty that you captured in your photos. You’re welcome. In a country that gets as much rain as New Zealand, a visitor who stays for a few weeks is bound to get rained out in some places. We were fortunate at the glacier but had so much rain on the Coromandel Peninsula at the end of our trip that both roads off the peninsula closed and we had to stay an extra day. I hope you’ll make it back to the glacier when the sun is out. I’m so fond of blue glacial ice, and there are some beautiful gradations in that second photo. Sometimes I look at it, and it seems to be flowing. At other times, it looks like a beautiful turquoise stone. The sharp “peaks” at the bottom left are interesting. It seems that both rock and ice have have that jagged shape. Is it the pressure of ice movement that’s created them? No expert on things glacial am I, but I have the impression that the huge weight of flowing ice did much to shape the rocks in that area. While I’d seen videos of blue glacial ice, this was my first and still my only time to see that icy blue in person. The glacier, by the way, was indeed flowing. I was too busy taking pictures to notice, but Eve saw a piece of ice fall off the front (as our guide book said might happen). That’s fun to see — and hear, depending on the size of the falling ice. When we were cruising Glacier Bay, we were cautioned to keep some distance from the ice walls, just in case. 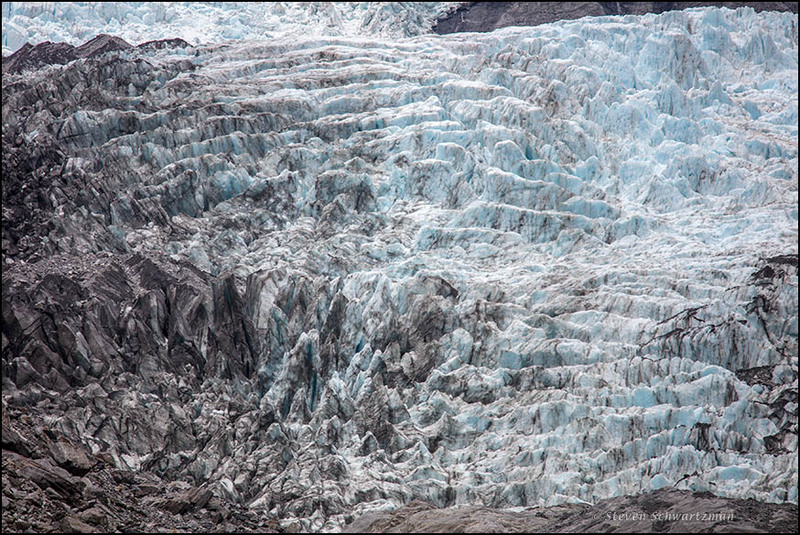 I took these pictures with a telephoto lens, so the glacier was farther away than it looks. At that distance Eve couldn’t hear any sound from the falling piece of ice. Occasional tourist helicopters further obscured any sounds. You may have read my comment that one guy illicitly passed beyond the barrier and got close to the front of the glacier. That’s risky indeed. That is a great view of the glacier! The ice is a lovely light blue. I’d been intrigued by that kind of blue in glaciers that I’d seen in photographs and documentaries. This was my chance to finally see it for real. Amazing photos. I live in Dunedin, NZ. Really happy that you got such good weather on the Wet Coast! All in all, considering how rainy a country New Zealand is, we made out pretty well and I was able to take pictures almost every day.